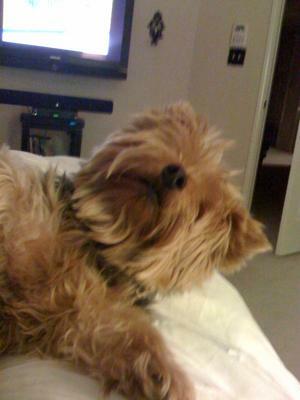 Born Feb. 8, 2001, Bentlie was a beautiful 12 lb yorkie that loved us more than we will ever know. He was with us through 3 US moves and babysitting other pets, which he tolerated, and many jobs, friends, and memories. He showed us true love, and didn't ask much of us. We are workaholics and had little time for anything. He waited. We worked out every day. He waited. We went to dinners. He waited. We shopped and lived our lives outside the house. He waited. Never held anything against us, just had true love in his eyes every time he saw us, like the first time we got him. He didn't like kisses, pictures, or baths, but he let us. He wasn't just a dog. He talked to us in so many ways: noises that sounded to us like "i wuv u," looks that said "stop bugging me," and doors opening with the push of his nose. He was equal to us in his eyes. But to me, looking back, he was better than us. We have hate, jealousy, envy, moods, egos, and he didn't. He was the closest thing to heaven on earth and if we are lucky, one day we can be with him again and feel true happiness. So sorry for your loss. He will forever be in your heart. Only time will help you heal. I am truly sorry for your loss. Your Bentlie sounds a lot like my buddy, Sabbath, Black Lab...passed away on 9/8/09. He was 14. He also did not like kisses and he pushed the door open many times with his nose. Funny. Thanks for sharing. Their personalities and unconditional love will always remain in our hearts.